You are here: Home / Ethnic Groups / The People of Sulawesi / Who are the Campalagian? Most of the Campalagian live in the Campalagian district, one hour east of the city of Majene, in the province of South Sulawesi. A large majority of the people live in fertile lowland areas that are conducive to growing various kinds of crops. This people group is also known as the Tulumpanueae or the Tasing. The language and culture of the Campalagian are heavily influenced by their more populous and powerful neighbors, the Toraja and the Bugis. The Campalagian identify more closely with the Bugis. 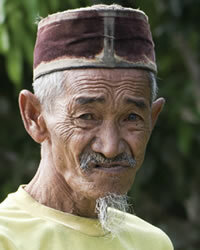 Their language, also called Campalagian, is part of a larger linguistic grouping called the Bugis family. This group includes the Bugis in the province of South Sulawesi, as well as the Dayak Embaloh and the Dayak Taman in Kalimantan (Borneo). The Campalagian work as farmers, fishermen, and traders. Campalagian farmers typically raise water buffalo, goats, cattle, and chicken. A farming community is known as a pallaung-ruma, which consists of two groups: pa’galung (farmers of irrigated fields) and pa’dare (farmers of non-irrigated fields). Fishermen are known as pakkaja. The tools used in their trade distinguish them: pameng use hooks and lines, pa’bagang use fishing platforms, pajala use nets; and pa’belle use special traps made of long nets. Trading occurs in the city of Campalagian, which is located on the coast. Marriage among the Campalagian people occurs entirely under the direction of the parents, including the selection of a spouse. In the field of education, the city of Campalagian does have a high school. Healthcare likewise seems to be at an adequate level, particularly when compared to other more poorly served areas. Almost every Campalagian person identifies as a follower of Islam. This overwhelming sense of Islamic identity affects societal and behavioral patterns in every sector of life. Various elements of Islamic culture are so integrated into traditional local culture that it is difficult to separate the two. As such, it is very hard for a Campalagian person to imagine that another Campalagian person would be something other than Muslim. The Campalagian also combine traditional animistic beliefs with Islam. This can be seen by their awe in facing invisible spiritual powers, or by their trust in the powers of a dukun (shaman/healer) to heal sicknesses and to cast out evil spirits. The Campalagian need help to improve the marketing and selling of produce from their farming and fishing industries. Infrastructure is needed, particularly in the development of good land and sea transportation. Another need is the development of human resources through education. The Campalagian region needs more teachers as well as the building of new schools and the repair of existing schools.